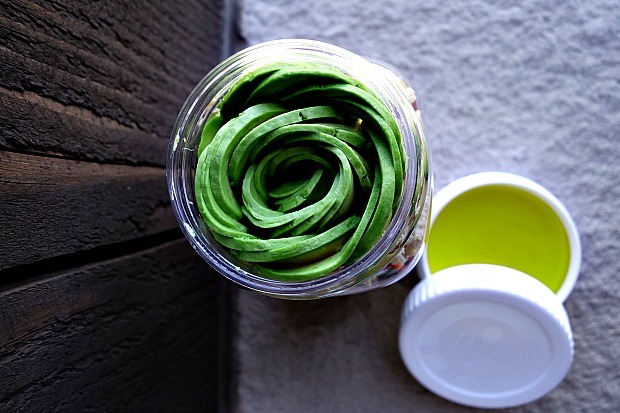 Foods in jars are all the rage these days and for good reason. With everyone constantly on the go it can be challenging to eat a healthy meal, especially when running from morning well into the evening. 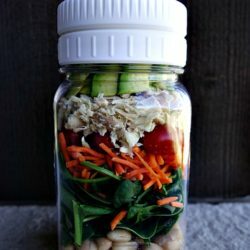 Foods in jars or salads in jars are ideal to take to work, to watch your child’s sporting events, on a picnic lunch, hiking or even on long road trips. Of course not all these events would be suitable to bring a glass jar, that’s why these Make & Take Mason Jars are ideal – made from BPA-free plastic. Years ago I did direct selling on the side while teaching cooking. I taught people how to make jewelry and had in-home jewelry parties, which prompted me to branch out from teaching culinary classes at venues to bringing my cooking classes into the home. Through my direct selling I met hundreds of other direct sellers and have kept in contact with them while remaining on their mailing lists. So when I received an email a few weeks ago about this product I couldn’t resist, and purchased 5 of them. One for my husband and I, daughter, son and his girlfriend, since I knew we would all be spending some vacation time together in the mountains. I’m not promoting this product but was excited to play around with the types of salads I could put in it, and just had to share it with you. Of course, you can add whatever you’d like into this container to suit your palate. Here’s a description of the Make & Take Mason Jar and quick video to show you how to use it by Pampered Chef. Now you can see why I was so excited about this product, especially since we’re all foodies here. Below is the recipe I created, full of nutrition and flavor without leaving you feeling stuffed. 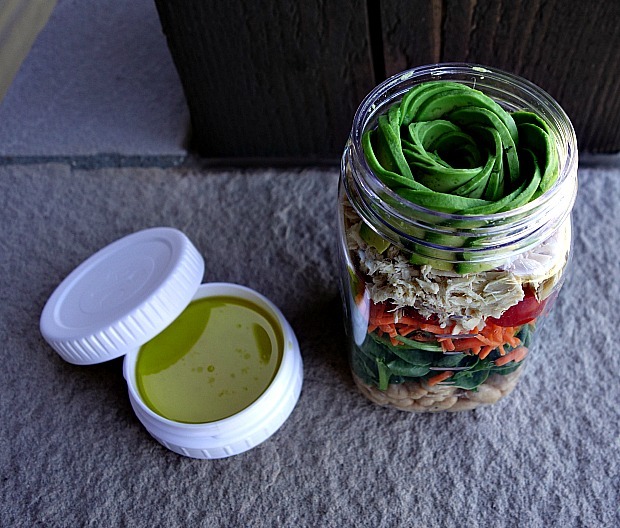 What creative salad or dish would you compose into the Make & Take Mason Jar? I put Cannellini beans in first – these are white kidney beans that are creamy and sweet, plus they’re high in antioxidants and have a low glycemic index. Then I added a handful of spinach to help seal the moisture from the beans. Spinach is low in fat and even lower in cholesterol. It’s high in niacin and zinc, as well as protein, fiber, vitamins A, C, E and K, thiamin, vitamin B6, folate, calcium, iron, magnesium, phosphorus, potassium, copper, and manganese. A layer of shredded carrots or for a prettier effect spiralize them. Carrots are high in beta carotene, fiber, and antioxidants. Plus they are rich in vitamin A, Vitamin C, Vitamin K, vitamin B8, pantothenic acid, folate, potassium, iron, copper, and manganese. Adding these makes perfect sense for health benefits, crunch, flavor, and color. I love tomatoes so added a single layer of baby tomatoes. Offering a host of health benefits for the eyes, stomach, blood pressure, diabetes, skin and even urinary tract infections. In addition, tomatoes can aid in digestion, stimulate blood circulation, reduce cholesterol, improve fluid balance, protect the kidneys, detoxify the body, prevent premature aging, and reduce inflammation. Plus they’re high in antioxidants, vitamins and minerals. For added protein I spread out a layer of white albacore tuna that I rinsed and drained to be sure to reduce any sodium that may have been added in the packaging process. For the final topping I sliced up half of an avocado. This fruit is incredibly nutritious! Avocados are loaded with heart-healthy mono-saturated fatty acids, loaded with fiber and can lower cholesterol and triglyceride levels, plus they’re rich in various nutrients, vitamins and minerals. Eating this wonderful green fruit will also keep your skin and eyes healthy. Imagine how eating this nutritious Salad in a Jar will have you feeling when you’re done. Create your own, or try mine! I love this Make & Take Mason Jar from Pampered Chef. I bought one for everyone in my family and then some. Best of all it comes with a fork and spoon that hook together to insure you’re able to get every last bit of food at the bottom of the jar. Salad or Food in Jars are so much fun. Set out a table of fixin’s and have everyone fill their own. I added a simple salad dressing of fresh lemon juice, olive oil and honey to suit my taste. It was perfect! I hope you’ll try this, and maybe even purchase your own Make & Take Mason Jar. Place ingredients into the jar in the order listed. If using the Make & Take Mason Jar then add the dressing to the screw top lid. Place lid on top of the jar once all the ingredients have been added. Refrigerate or place in cooler until ready to eat. I am not being compensated for talking about the Make & Take Mason Jar. This is strictly a product I loved and wanted to share with my viewers. Fun idea! I suppose one could use a regular mason jar, although it wouldn’t look as spiffy. Thanks for a great idea! Absolutely any mason jar would work. I especially liked this one because it wouldn’t break, has the top that doubles as a dressing container and it comes with a fork and spoon that connect to make it extra long to reach into the very bottom of the jar. I love the idea and that avocado rose atop looks really great! Thanks Angie. I plan to demo that for tomorrow. I’ve been so busy I’ve been running behind on posts. Of course I remember you! Will do. What a great product! 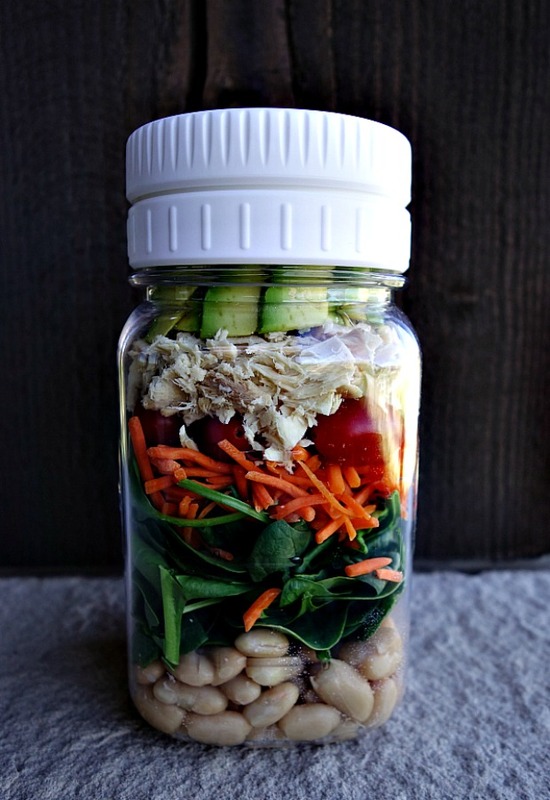 I love the look of the mason jar salads, but never thought they were that practical since they’re made of glass. I love all your healthy layers!